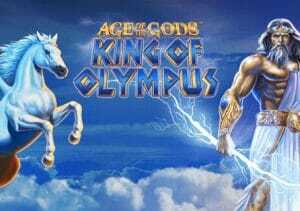 Age of the Gods King of Olympus is powered by Playtech and is part of the Age of the Gods series. With 5 reels and 25 paylines, this progressive jackpot slot can be played from 25p to £250 per spin. Available across desktop, mobile and tablet devices, it’s a clone of the Marvel Iron Man 2 slot. The game is based on Zeus whose abode was Mount Olympus – in Greek mythology, Zeus is the god of sky, lightning, thunder, law, order and justice who ruled as the king of the gods of Mount Olympus. With beautiful graphics and animations, symbols on the reels include Zeus himself, the winged divine stallion Pegasus, the Eagle of Zeus, a ship, harp and vase. The highest value symbol is Zeus as he is the wild symbol and rewards you with 40 times your stake if you get 4 on a payline. If you manage to get 5, you will get 120 times your stake. The other symbol to look out for is the Temple of Zeus which is the scatter. There’s more – the Zeus wild symbol will appear in the middle position of reel 3 (the middle one) and remain locked for the duration of the feature. The only downside is that you cannot retrigger the feature therefore not winning any more free spins. There’s also the small matter of 4 progressive jackpots to be won. Triggered at random, you will come across a 5×4 grid containing 20 gold coins – these hide different jackpot symbols. You then pick coins to reveal the symbols – once you match 3 identical jackpot symbols, you will win that particular progressive jackpot. You have the Power, Extra Power, Super Power and Ultimate Power jackpot – the latter can be life-changing! I love anything with Zeus (sorry King of Olympus) in it and it’s a medium variance game which is nicely balanced. However, the best video slot is Age of the Gods which encompasses Athena, Hercules, Poseidon and Zeus.